Necessity is the mother of invention, but has no familial relation to good design. Sticking two cups of different sizes together and hoping they don’t spill is medieval (not literally, it’s actually 19th century), and even in modern shakers, the process of getting the shaken beverage out of the shaker is sleight of hand at best. OXO fixed it. OXO’s Press and Pour Cocktail Shaker is insulated and self-straining, with one-button operation to open and close the pour-through lid, similar to the Ember Mug we love so much. If you’ve had any experience with bad travel mugs, that complex lid design should throw up a red flag, but not to worry. 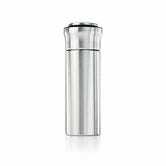 Like your favorite Contigo Travel Mug, the OXO Shaker’s lid disassembles and is dishwasher safe. On a related note, the Wikipedia article on cocktail shakers is one of the most interesting I’ve read in a while.